Football: Montreal new No. 1, Laurier joins Top 5 and who voted for Acadia? Was it Randy? One man with courage makes a majority, and where I come from — Canada — we reward courage. Montréal is the new No. 1 team in the nation, but not unanimously. 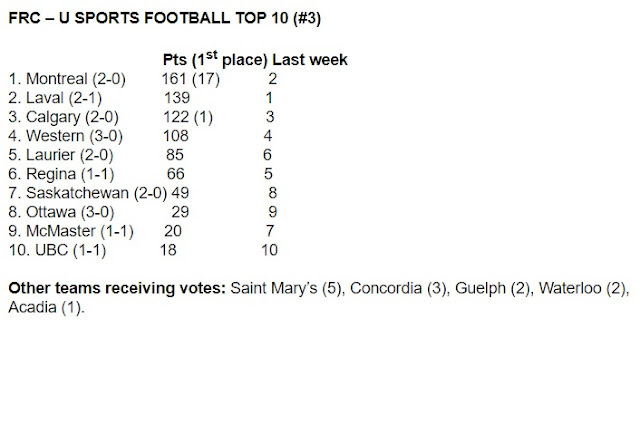 Take a bow, Gord Randall of KROWN Countdown U, for being the one to give the Dinos a first-place vote. There's two games with down-ballot implications this week. Ottawa is at McMaster for a Brass In Pocket Bowl (since, you know, one of them is a pretender). Saskatchewan and coach Scott Flory get a major test at UBC. For what it is worth, a quick explanation of my ballot. Montréal (2-0 RSEQ, vs. Sherbrooke/Fri.) — They beat The Man, so they are The Man. Calgary (2-0 CW, at Manitoba/Sat.) — A three-score margin against Regina at home > Laval's one-score margin of defeat at Montréal..
Laval (2-1 RSEQ, bye week) — See No. 2. By the way, Rouge et Or coach Glen Constantin is giving his team the equivalent of a three-day weekend during its bye week. Odd numbers are unwieldy for scheduling, but the "eight over 10" format the easternmost conferences are using is probably going to pay a dividend later in the season. Western (3-0 OUA, at Windsor/Sat.) — Guelph: "We scored 82 points against Windsor." Western: "Hold our beers." Regina (1-1 CW, vs. Alberta/Sat.) — As long as they have Noah Picton, they can play with almost anybody. Laurier (2-0 OUA, at Queen's/Sat.) — One team whose strength might have been taken on faith a little, and if Saskatchewan had played more credible opposition I might have faded the Golden Hawks. Anyway, Laurier has a good litmus test against Queen's (0-2), which is facing a must-win, is at home after a bye and might also have the emotional lift from the honouring 25th anniversary of their 1992 national championship. Saskatchewan (2-0 CW, at UBC/Sat.) — The next two weeks are a gauge of whether Canada West is a honest-to-goodness four-horse race. And it's not just how Saskatchewan represents itself at UBC and at Calgary, but whether they get through unscathed. McMaster (1-1 OUA, vs. Ottawa/Sat.) — Restricting Western to fewer than 375 yards is no mean feat. The Marauders need to find a quarterback like yesterday. If frosh QB Jackson White is The Future, how long do they wait before making him the present? Saint Mary's (2-0 AUS, vs. Acadia/Fri.) — Huskies receiver Archelaus Jack might be an early leader in the national rookie of the year conversation, says the dumb guy who doesn't listen to the podcasts that probably called it a month ago. Jack, a Northern Football Conference alumnus, was a Saskatchewan Roughriders practice squad player last season — well, who wasn't? — and is off to a great start at SMU. Ottawa (3-0 OUA, at McMaster/Sat.) — Two of the four teams chosen from OUA are all defence, middling offence. When did the league become the Quebec conference from five years ago? UBC (1-1 CW, vs. Sask./Sat.) — If the ranking went to 11, then the Thunderbirds would be shooed in. There are scarcely few teams as athletic as UBC, which reaping the reward of a few currents, such as renewed investment in the team and the bumper crop of talent in the province thanks to the "Four-Down Immersion Program" put into practice by many high school teams in the Lower Mainland. But right now they are just .500 after two games, with a clear loss. Waterloo (3-0 OUA, at Carleton/Sat.) — The lost their Stassen-esque base after winning. It was tough to overlook this triptych: they defeated Toronto by less than a touchdown; Toronto defeated Windsor at home by a touchdown; and Windsor, well, our heart goes out to Windsor. So I had to bump out the Warriors. Ottawa has wins against at least one eventual playoff team. Sheer process of elimination suggests Guelph (1-2) and/or Queen's (0-2) will qualify. Guelph (1-2 OUA, at U of T/Sat.) — They have the capability to earn home field for an OUA quarter-final, since this season is headed toward some mass pile-up of 5-3 and 4-4 teams. It's just that there's a distaste here for rewarding teams for "almost wins" or meaningless slaughters, and that's all Guelph has played so far.